Terrier tank locomotive No 32678 with train, south of Havant station, c 1950s. 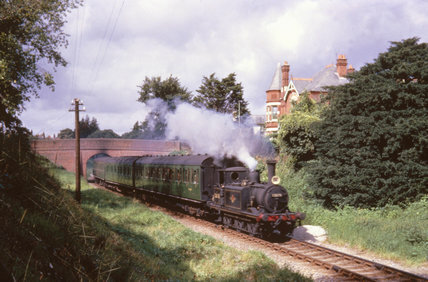 Terrier' tank locomotive No 32678 with train, south of Havant station, Hampshire, c 1950s. The short branch between Havant and Hayling Island in Hampshire was worked for much of its existence by diminutive 'Terrier' tank locomotives. They were ideally suited to it because of the weight restrictions on the timber viaduct acros the Langstone Channel. The ageing rolling stock and the condition of Langstone Bridge were important factors in the decision to close the branch in 1963.